For other politicians named John Hall, see John Hall (disambiguation). John Joseph Hall (born July 23, 1948) is an American musician, politician, environmentalist and community activist. He was elected to the county legislature of Ulster County, New York, in 1989 and to the Saugerties, New York, Board of Education in 1991, and he was the U.S. Representative for New York's 19th congressional district, serving from 2007 to 2011. He is a member of the Democratic Party. The 19th District includes all or part of five counties on both sides of the Hudson River: Westchester, Putnam, Dutchess, Orange and Rockland, with more than 650,000 residents. Hall also founded the rock band Orleans in 1972, a musical collaboration that continues to this day. Hall was born in Baltimore and grew up in Elmira, New York, son of James A. Hall, PhD in Electrical Engineering and Marie W. Hall, MA in Divinity. A three-time National Science Foundation summer scholar, he skipped two grades in school and left Notre Dame High School in Elmira at age sixteen to study physics at the University of Notre Dame, and then Loyola College, Baltimore. He led another life in music, starting with piano at age 4, studying French horn in school and teaching himself guitar and bass. After changing his concentration to creative writing and performing in numerous musical ensembles, Hall quit college to begin his professional musical career in the clubs of Georgetown, DC, and then Greenwich Village. In 1967, his group Kangaroo released an album on MGM Records, and Hall also composed music for a Broadway theatre trilogy Morning, Noon and Night. While playing at Cafe Wha in Greenwich Village, he met his first wife, Johanna Schier, with whom he moved to Woodstock, and then Saugerties, New York, wrote many songs and fathered a daughter, Lillian Sofi Hall. He also found time to release his debut solo album, Action in 1970. He was already a songwriter and/or session musician for such artists as Janis Joplin, Seals & Crofts, Taj Mahal and Bonnie Raitt when, in late January 1972, he founded Orleans in Ulster County, New York with Wells Kelly and Larry Hoppen. Lance Hoppen, Larry's brother, joined the band later in that year, completing the Orleans lineup that would last throughout the band's most successful period. Orleans released two albums on ABC Records, and two on David Geffen's Asylum Records label, the latter two including the top five hits "Dance With Me" and "Still The One" which are each certified by BMI at more than 4 million airplays in the U.S. alone. In 1977, Hall left to concentrate on the solo career that had begun with the Action album at the beginning of the decade and became active in the anti-nuclear movement, fighting to stop a nuclear plant planned for Cementon on the Hudson River, and co-founding Musicians United for Safe Energy with Jackson Browne, Bonnie Raitt and Graham Nash. His second solo recording of that period (his third overall) included the title track "Power," which became an environmental anthem performed by Pete Seeger, Peter Paul and Mary, Holly Near, and the Doobie Brothers and James Taylor who cut it live at the No Nukes Concerts at Madison Square Garden. At the dawn of the 1980s, he formed the John Hall Band, which consisted of Hall, keyboardist and vocalist Bob Leinbach, bassist and vocalist John Troy, and drummer Eric Parker. The John Hall Band released two albums on the EMI America label with high AOR and MTV visibility but limited Top 40 success. "Crazy (Keep On Fallin')," from the album All of the Above, was the band's only major hit (U.S. #42) and was in heavy rotation on MTV for months. On a parallel track, during his residence in Saugerties, Hall co-founded two citizens' groups: Saugerties Concerned Citizens and the Winston Farm Alliance. The former helped close down many illegal junkyards operating in the town; the latter successfully opposed the siting of a giant dump and incinerator on the historic Winston Farm, named after the engineer James Winston, who designed New York City's system of reservoirs and aqueducts. Hall also served one term in the Ulster County Legislature, and was elected twice to the Saugerties Board of Education, where his fellow trustees elected him President. Hall spent decades writing songs for other artists and reunited with Orleans in 1985, rejoining them intermittently up through 2006. Meanwhile, John and Johanna separated and divorced, and he moved from their house in Saugerties, New York, living briefly in Hunter, NY, then in Nashville, TN. There he wrote more songs including co-writing Steve Wariner's #1 country hit "You Can Dream of Me," began touring with Jonell Mosser and Freebo, and continued sporadically performing with Orleans. More importantly, he met and fell in love with Pamela Bingham, a guitarist and attorney whom he would marry in 2001. In 2005, he released Rock Me on the Water, an album of songs inspired by an extensive sailing trip that took John and Pamela Melanie (as she is known to her friends) from Kingston, New York, to Key West, with a side-trip to Havana, Cuba on a legal humanitarian aid delivery, and later Martha's Vineyard, Cuttyhunk, and Annapolis, Maryland. He also formed the band Gulf Stream Night with longtime Orleans drummer Peter O'Brien, percussionist Joakim Lartey, bassist Bobby MacDougal, and his wife Pamela, who co-wrote four of the songs on the CD, on vocals and guitar. Having sold the boat and moved back to the Hudson Valley of New York, this time to Dutchess County, the Halls began to settle in and make new friends in Dover and Millbrook, where "Gulf Stream Night" was recorded. Orleans also released a new CD in 2005, Dancin' in the Moonlight, containing many of Hall's writing collaborations, guitar parts and vocals, and two songs co-written by John and Pamela Melanie Hall. During the fall of 2005, Hall's dissatisfaction with the incumbent Congresswoman representing his new home town contributed to his decision to put musical projects aside and run for the seat in NY's 19th Congressional District. He defeated several other Democratic candidates in the primary, and surprised many[who?] by winning the election over 12-year incumbent Sue Kelly. As a member of the House of Representatives for four years, Hall served on the Select Committee on Energy Independence and Global Warming, the Committee on Transportation and Infrastructure, and the House Veterans Affairs Committee. Perhaps his biggest impact in Washington came as a result of his appointment by then Speaker Nancy Pelosi to be Chairman of the Subcommittee on Disability Assistance and Memorial Affairs. One of only three freshmen Representatives assigned a chairmanship, Hall used his chairmanship to hold hearings, take testimony from VA officials, veterans and their families, health and mental health experts, officers active and retired, and representatives of virtually every Veterans' Service organization. The result was the Veterans Claims Modernization Act of 2008, which passed the House and Senate unanimously and was signed into law by President George W. Bush, who called it "good government". Hall was re-elected easily in 2008 over Republican Kieran Lalor, but lost in the 2010 election to doctor and drug company publicist Nan Hayworth. After serving ten years in elective office, and citing the prohibitive campaign fund-raising necessary as a result of the Supreme Court's decision in Citizens United v. FEC, Hall announced that he would not seek re-election. Although his musical career was on hold during his time in office, Hall performed at the concert honoring the 90th birthday of Pete Seeger, supporting the Hudson River Sloop Clearwater at Madison Square Garden in New York City on May 3, 2009. He joined other performers in the singing of "Oh Mary Don't You Weep" and later joined the entire cast for an encore, singing "Good Night, Irene". In August 2011, Hall joined his MUSE cohorts Bonnie Raitt, Jackson Browne, and Crosby Stills and Nash along with Jason Mraz, the Doobie Brothers and Tom Morello for a benefit concert in Mountain View, California, proceeds to aid victims of the tsunami and nuclear meltdowns in Fukushima, Japan, and to promote renewable energy. John and Pamela Hall, along with co-lyricist Bob Furlong, wrote the song "I Told You So" and performed it with Browne, Raitt and Nash at the concert. Hall is currently[when?] dividing his time between performing solo and with Orleans, and writing for a new project. In late October 2004, Hall publicly commented that the presidential campaign of George W. Bush had not asked for permission to use the Orleans song "Still the One" at campaign events. The campaign later dropped the song from their playlist. Four years later, Hall expressed similar disapproval when John McCain's presidential campaign also used the song without asking for permission. He has been involved with Mid-Hudson Nuclear Opponents, who successfully fought the siting of a nuclear power plant on the Hudson River in Greene County. While living in Saugerties, New York, Hall co-founded Saugerties Concerned Citizens, and helped write the town's first zoning law. When Ulster County announced plans for a 200-acre (0.81 km2) solid waste dump on the historic Winston Farm, Hall led the opposition. This effort culminated in his 1989 election to the Ulster County Legislature. In the late 1990s, after three successive school budgets were rejected by the voters, John ran for, and was elected twice to, the Saugerties Board of Education. His fellow trustees elected him president, and budgets were passed each year of Hall's tenure. Despite representing an historically Republican area, Hall has described himself as a progressive Democrat. He was a member of the Congressional Progressive Caucus. In the beginning of the 110th Congress, Hall voted to raise minimum wage and federal funding of embryonic stem cell research. Prior to the election, Hall expressed interest in drug policy reform, noting that many of his best friends and mentors in the music industry partake in recreational drug use without adverse effects. At SUNY New Paltz, during a March 11, 2006 audio interview, he said that drug prohibition had "failed" and that he agreed with Maurice Hinchey on the need for reform on Plan Colombia, Medical Marijuana, and a provision of the Higher Education Act that denies financial aid to students with drug offenses. However, in July 2007, John Hall voted against an amendment by Hinchey that would end the raid of medical marijuana patients. Hall voted for the Healthcare Reform Bill that passed in the House on November 7, 2009 as well as the Senate bill on March 21, 2010. He opposed the Stupak Amendment which proposed to restrict the use of federal funds for abortion funding. He was also a critic of BP's handling of the Deepwater Horizon oil spill in the Gulf of Mexico. Hall was assigned to serve on the House Committee on Transportation and Infrastructure and was chairman of the Subcommittee on Disability Assistance and Memorial Affairs of the Veterans Affairs Committee in the 110th Congress. Hall ran for Congress in the 19th District in the September 2006 primary race as a Democrat in New York's 19th congressional district. He won the primary, with a commanding 48% in a 4-way race, and faced incumbent Sue W. Kelly in the November election. Hall defeated Kelly with 51% of the vote, losing to Kelly in Putnam, Dutchess, and Rockland counties, but carrying the incumbent's home county of Westchester, as well as Orange, to pull off the upset. According to an article in the Hudson Valley newspaper, the Middletown Times Herald-Record, two days after his primary victory, Hall, in an online chat with the progressive blog Firedoglake, was asked about his position on a possible impeachment of then-President George W. Bush. Hall stopped short of endorsing impeachment "before hearing evidence", but added that "Whether impeachment or censure, some action must be taken to circumscribe the powers of the presidency". When pressed on the issue, "he candidly reminded the probing blogger, 'I'm trying to get elected in an historically Republican district.'" Hall was interviewed by Comedy Central-based satirist Stephen Colbert on October 19, 2006 for a "Better Know a District" segment of his popular comedy show, The Colbert Report. Stephen Colbert said that he opposes everything that John Hall stands for, but Hall was willing to talk to him; Sue Kelly turned down the opportunity to be interviewed so John Hall picked a "Smear Card" which said "My opponent smokes marijuana". Colbert replied by saying "That's a bold accusation, that someone in the press should investigate or at least look up on because it's out there now; it's out there now that Sue Kelly smokes pot. DEA, check out her house. Look for Grow Lights. I'm not saying it. He is". As the centerpiece of the interview, Colbert eventually convinced Hall to harmonize with him on the Orleans song "Dance with Me". He made a brief encore appearance on The Colbert Report the day after his election, November 8, joining Colbert in a harmonized rendition of The Star-Spangled Banner. Although the 19th is an historically Republican district, Republicans had trouble recruiting a strong challenger to Hall. Several potential top-tier candidates, such as State Assemblyman Greg Ball, Orange County Executive Ed Diana, and former White House Press Secretary Ari Fleischer all declined to run for the seat. 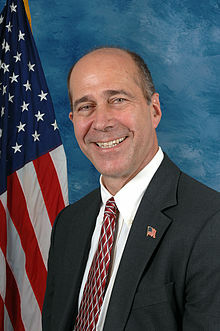 Andrew Saul, head of the Federal Thrift Retirement Investment Board had begun raising funds for a campaign but announced on November 20, 2007 that he would not run. In February 2008, however, Saul was rumored to be considering entering the race once again and had launched online polls to gauge interest. Hall drew numerous potential challengers for the 2008 race, including Iraq veteran Kieran Lalor and Westchester County Legislator George Oros. Other potential challengers included Sue Kelly, ex-Congressman Joseph J. DioGuardi, ex-State Superintendent of Insurance Howard Mills, ex-NYC Finance Commissioner and State Tax Commissioner Andrew Eristoff, Emily Pataki, the daughter of former Governor George Pataki, and ex-Pataki campaign manager Michael Finnegan. Having received the endorsement of the Republican committees in all five counties in the district, Lalor was the only remaining Republican challenger. On November 4, 2008 Hall was re-elected to serve the 19th district of New York in the 111th session of the United States Congress. He defeated Republican newcomer Kieran Lalor, taking 59% of the vote. In January 2009, Hall declared his support for Kirsten Gillibrand becoming the junior senator of New York, a seat vacated by Secretary of State Hillary Clinton. Facing a tough re-election, Hall lost to Republican nominee Nan Hayworth in the 2010 election. In July 2011, Hall announced that he would not seek a rematch with Hayworth. He said he wanted to spend time with his family and travel across the country with his band, Orleans. Democrat Sean Patrick Maloney was selected as Hayworth's 2012 challenger and on November 6, 2012, he defeated her by a margin of 52%–48%. ^ Unterberger, Richie. "Kangaroo". All Music. Retrieved 2013-11-04. ^ "Rep. to McCain: Stop Using My Song!". Firstread.msnbc.msn.com. Archived from the original on 2008-09-22. Retrieved 2011-11-04. ^ Nichols, John (November 9, 2006). "The Crowded Progressive Caucus". The Online Beat. The Nation. Retrieved 2007-03-16. ^ "PDA Candidate John Hall Elected as New Yorkers Vote for Change". Progressive Democrats of America. November 9, 2006. Archived from the original on September 27, 2007. Retrieved 2007-03-16. ^ "Caucus Members & Contact Information". Congressional Progressive Caucus. Archived from the original on 2007-03-28. Retrieved 2007-03-16. ^ "Final Vote Results for Roll Call 18". U.S. House of Representatives Office of the Clerk. 2007-01-10. Retrieved 2007-03-16. ^ "Final Vote Results for Roll Call 20". U.S. House of Representatives Office of the Clerk. 2007-01-11. Retrieved 2007-03-16. ^ "FINAL VOTE RESULTS FOR ROLL CALL 733". Clerk.house.gov. 2007-07-25. Retrieved 2011-11-04. ^ "Hall Statement on the Ongoing Deepwater Horizon Oil Spill". Johnhall.house.gov. 2010-06-07. Archived from the original on 2010-06-08. Retrieved 2010-08-23. ^ Brendan Scott, Democrat John Hall tiptoes around presidential impeachment stance, Times Herald-Record (Hudson Valley and Catskills), September 16, 2006 (retrieved 11/8/06). ^ Tumulty, Brian. "Katonah's Saul drops out of 19th Congressional District race"[permanent dead link], Lower Hudson Online, November 21, 2007. ^ The Associated Press. "Paterson appoints upstate Rep. Gillibrand to Senate seat". recordonline.com. Retrieved 2010-07-12. ^ "NYS Board of Elections". NYS Board of Elections. 2010-11-02. Retrieved 2014-11-17.